This morning, I was pondering over the great changes between my thoughts, feelings and actions in the different phases of my mood swings - manic and depression. Whenever I am well or manic, I am filled with the joy of the Lord, have more energy, more creativity and enjoy relating to people and doing things, and able to accomplish much for the Lord and for others. Whenever I am unwell or in clinical depression, I am the total opposite - so miserable from the time I wake up until the time I go to bed, so slowed down and exhausted that I have no energy to do anything, can hardly get up of my bed, my mind is so empty and unable to focus that I can't get anything done properly, hate to relate to people and just want to be alone. How terribly inconsistent are my behaviours! I must have confused lots of people around me! Thankfully some of them are beginning to understand that with bipolar disorder (manic-depressive illness), some of these things are beyond my control. I am trying, by God's grace, to manage this condition better but it is not easy. I do get discouraged at times in the difficulties of managing this condition. Knowing how weak and inconsistent I am, I am learning to look to the Lord daily for grace to live for Him. I realized that I also need to lower my expectation of myself and others as we are forever changing and have many limitations. I am reminded that though I am always changing and so are the people and circumstances around me, God is unchanging. 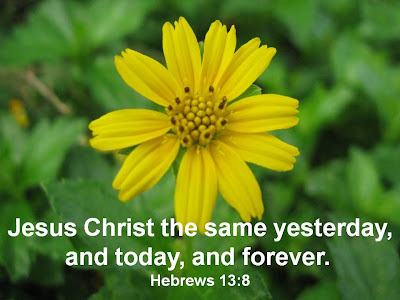 The Lord is the same yesterday, today and forever. I can rest in His love, mercies, grace and faithfulness. What a mercy and encouragement! Hope this article by CH Spurgeon will encourage you just like the way it has encouraged me. THE Israelites in the wilderness were continually exposed to change. Whenever the pillar stayed its motion, the tents were pitched; but to-morrow, ere the morning sun had risen, the trumpet sounded, the ark was in motion, and the fiery, cloudy pillar was leading the way through the narrow defiles of the mountain, up the hillside, or along the arid waste of the wilderness. The Christian knows no change with regard to God. He may be rich to-day and poor to-morrow; he may be sickly to-day and well to-morrow; he may be in happiness to-day, to-morrow he may be distressed—but there is no change with regard to his relationship to God. If He loved me yesterday, He loves me to-day. My unmoving mansion of rest is my blessed Lord. Thank you for stopping by. Take care and have a blessed week! That was a Awesome post! We can rest in our unchanging God!! Hi Julie, Yes, praise the Lord that we can rest in our unchanging God! Thanks for your visit. Take care! Hi Anonymous, thanks for your visit. Glad you like the post. Hi Nancie! This post is such an encouragement! Hope all is well with you. Although I don't drop by as often, you're always in my thoughts and prayers. This is good stuff. Thanks for the reminders, all true! God is the same yesterday, today and forever. This is what I can rely on. I love the Psalms too. I have thought, and heard others concur, that David was possibly bipolar too. When you read the Psalms he sure is up and down! I understand your struggle with your constantly changing moods. It is not an easy life, as I know too well. But you are evidence that it is not a wasted life. You are an example of someone making use of their handicap to encourage others. Thanks for the article by Spurgeon, that was good.